Thank you for all your great feedback on the inaugural WEBLetter. So many good ideas to incorporate, and here are just a few ideas that came from you – our members. We plan to address many of these in this or future WEBLetters. Thank you! What is our collaboration with the Young Hearts? Could we do a spotlight on board members, or new members? Board meeting outcomes – what happens at board meetings (good question)? How are directors chosen? What do I do if I want to direct a show, or have a show for consideration? How are props and costumes found? Who manages storage and the donation of items? How do people get trained to run tech, lighting, sound? In 2012 – just six years ago – Providence Players formed an incredible partnership with The Young Hearts. Who are The Young Hearts? An incredible group of teens, family and friends who improve the lives of young people affected by long-term illness through raising funds for medical research, providing support for families affected, and raising awareness. In the summer of 1998, just before he was supposed to start 7th grade at Frost Middle School, Ryan McLaughlin, a bright and goofy eleven year old, was diagnosed with t-cell leukemia. After more than a year of grueling treatments and relapses, Ryan lost his courageous battle on December 2, 1999, leaving behind heartbroken friends and family. Determined to continue fighting for those who were still battling this disease, Ryan’s friends, neighbors and classmates came together with his family to participate in the Leukemia & Lymphoma Society’s Light the Night Walk. 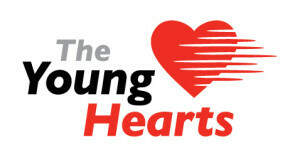 Made up of mostly elementary, middle and high school students, they called themselves Young Hearts. In 2012, PPF and The Young Hearts collaborated on PPF’s first production of The Best Christmas Pageant Ever. As a result of this collaboration, the production broke attendance records for the holiday production and generated over $8,000 in support to its important mission. Since then, PPF and TYH have collaborated on each and every holiday production since, including A Christmas Carol, The Lion, the Witch and the Wardrobe, Snow White and the Family Dwarf, and The Phantom Tollbooth. Over that period, PPF and TYH have generated thousands of dollars in support of this important mission. 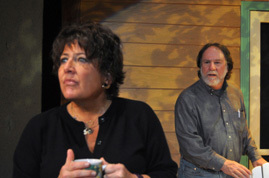 Michael Donahue, Director of August: Osage County anticipates having auditions early December. A separate notice will go out, but wanted to give everyone a sense for when they will be. For recent information on any and all auditions you can always check the audition announcement page. 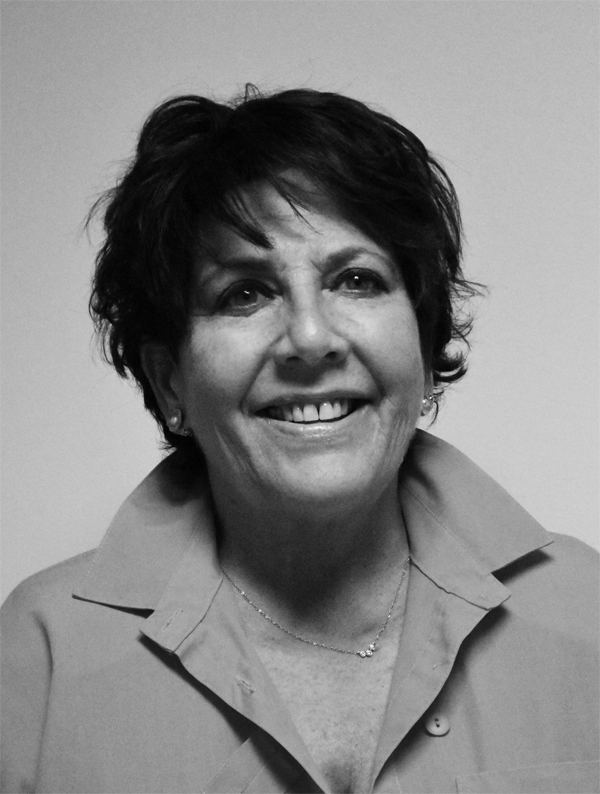 “I majored in theatre arts in college a long time ago, but as many in DC do, I got sidetracked into politics and government relations, which became my profession. The itch to get back to what I loved the most was always there, but there was never time to audition, or at least that was my excuse. I read an article about getting outside the box and getting outside one’s comfort zone so I took the dive and signed up for an acting class. I realized theatre was my true love and I began to regain my confidence about being on stage. And then I took the plunge and actually auditioned for a part in a play in a community theatre and I was cast! Being involved in the rehearsal process and meeting other “theatre people” was euphoric…. 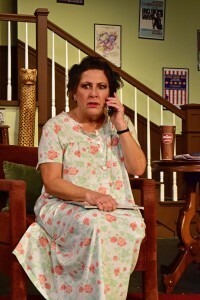 then came opening night. The adrenalin was flowing, I made my entrance and in my mind I was opening on Broadway just as I had a million times in my little girl’s mind. The experience was everything I had hoped and I relearned things like being in the moment, the generosity of one’s fellow actors and how hard it is to memorize all those lines. I was hooked again and could not wait for another opportunity to audition. I had never heard of Providence Players before but learned they were holding auditions for a play called Moon Over Buffalo by DC resident Ken Ludwig. I was looking for a comedy so I mustered the courage and went to auditions. The director asked me to sing Happy Birthday, but this was not a musical! I did it anyway and got cast as a woman at least thirty years my senior. It was a blast and I had the time of my life. 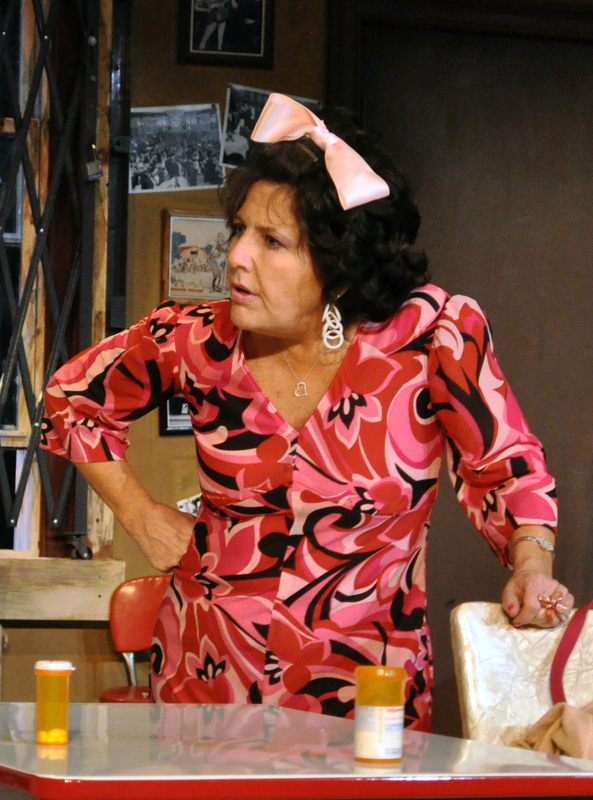 I knew then PPF was someplace I loved being, it was my true definition of a community theatre. The people were welcoming, talented, fun and funny. Since then I have been so lucky to be able to perform for PPF several more times as well as hone other skills such as set decoration and producing. And I have not only made lifelong friends, but I met my other true love and fortunately he is a “theatre person” too. We met playing husband and wife, now we are real life husband and wife. The Providence Players is a family and we are always looking for people who might want to get outside their comfort zones, or meet new people, or rekindle that desire to get involved in the theatre…..again. I think we are so lucky to live in an area with so much great talent and so many great theatres, professional, regional and community. To me, community theatre is a great way to see shows you might not otherwise be able to see and for a very reasonable price. And it is an opportunity to support your community and your friends. I can assure you, you will be welcomed with open arms. Just one month away. It’s going to be a great event. Not to be missed. 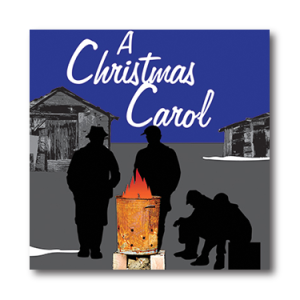 On November 1, the cast and production team start rehearsals for a special adaptation of A Christmas Carol. 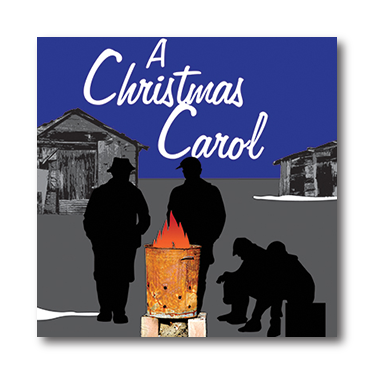 Adapted by Rob Zapple, (a friend of members, Pat and Ingrid David, this version of the famous uplifting story of Ebenezer Scrooge, Bob Cratchit and Tiny Tim takes place in a similar environment reflected in Dickins’ classic: Depression in the 1930’s in a “Hooverville” just outside of St. Louis Missouri. The era of poverty and strife reflect the same desperation in 1880’s London England. This version of A Christmas Carol by Rob Zapple was written 30 years ago for a theater in Los Angles. Zapple has been quoted as saying, “relocating the story helps focus on its meaning.” We agree. “The universal themes of compassion, joy, the boundless strength of the human spirit, the magic of the holiday season and the possibility of redemption for a life misused, all rang as true in America during the 1930s, and now, as they did 172 years ago when Dickens published his story,” Zapple said in a news release for a 2015 production in Wilmington North Carolina. To buy tickets for the holiday production, please go to the PPF ticket site. 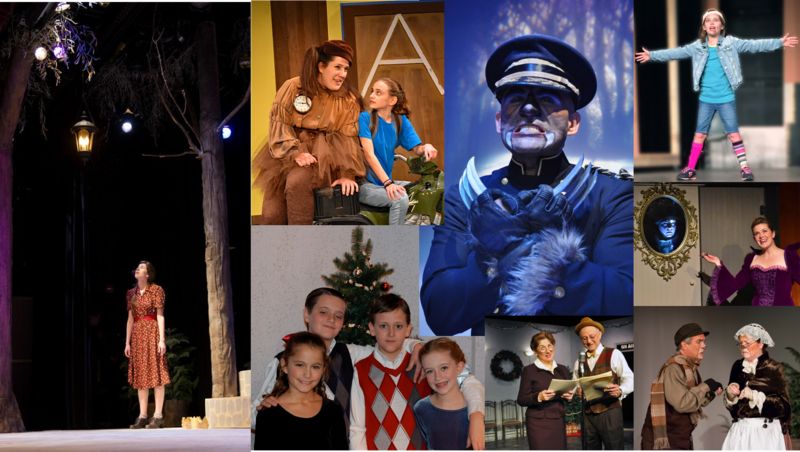 In recognition of the upcoming holidays and holiday production, we are bringing to you some photos of previous holiday productions. Click on the image to enjoy the full collage. Enjoy! Did you miss our last set build? People had so much fun! 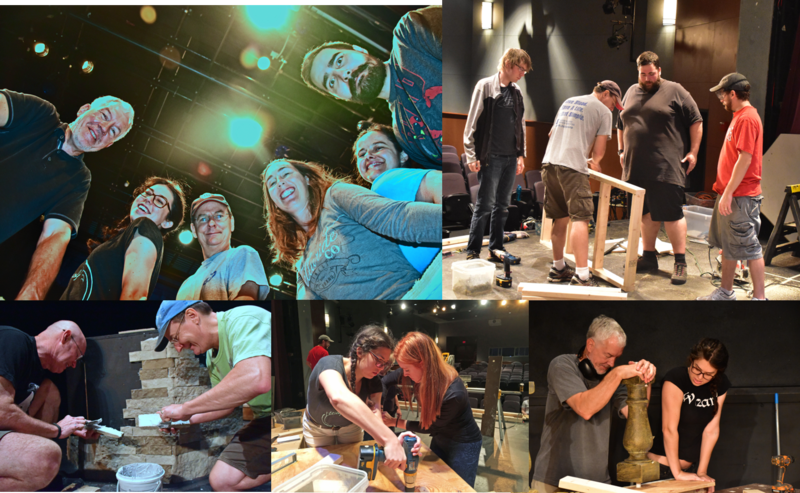 Enjoy the photos, and make sure you mark your calendars for the next set build on Nov. 10 & 11. Welcome back, members Julie Janson and Chris Crockett – back from Alabama, baby! So glad to have you back! Welcome new members: Jeanna Lee, Kyle McClain, Steven Palkovitz, Daniel Lavanga, Danielle Phan, Thomas Udlock, Sarah Lemon, Chloe Sinder and Shawn Hubbard.